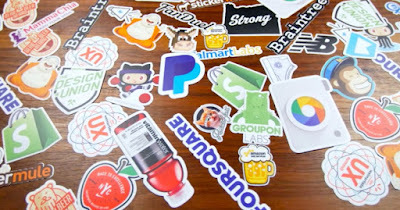 Savvy Spending: Get a 10 pack of customized Viynl Stickers for just $1 shipped! Get a 10 pack of customized Viynl Stickers for just $1 shipped! You can get a 10 pack of customized Vinyl Stickers! Just visit StickerMule.com and score this 10-count Pack of 3″ x 3″ Custom Die Cut Vinyl Stickers or this 10-Count Unixstickers Die Cut Vinyl Stickers Pro Pack for just $1 (regularly $20). The discounted price will automatically apply at checkout. Add a business logo, a fun graphic, or a monogram!